TORONTO, Dec. 21, 2011 /CNW/ – Twenty-one percent of executives interviewed for The Creative Group Hiring Index for Marketing and Advertising Professionals said they plan to add full-time staff in the next three months, and 6 percent forecast reductions in personnel. Most respondents, 68 percent, expect to make no changes to their current staffing levels. The Canadian study was developed by The Creative Group, a specialized staffing service providing interactive, design and marketing professionals on a project and full-time basis, and conducted by an independent research firm. It is based on more than 250 telephone interviews — approximately 200 with marketing executives randomly selected from companies with 100 or more employees and 50 with advertising executives randomly selected from agencies with 20 or more employees. and down 11 points from the previous quarter. confident in their companies’ growth prospects for the first quarter. specialties in greatest demand, according to executives interviewed. When executives were asked in which areas they plan to add staff, web design/production ranked first, with 29 percent of the response, followed by public relations and social media, each with 23 percent. Fifty-four percent of respondents said it’s challenging for their firms to find skilled creative professionals. Note: Multiple responses permitted. Top responses were shown. View the research highlights (http://creativegroup.mediaroom.com/file.php/285/TCG_1211_GRPH_HiringReport_CAN.jpg). Marketing and advertising executives’ confidence in their ability to attract new business declined from last quarter: Eighty-two percent of those interviewed said they were somewhat or very confident in their firms’ prospects for growth in the first quarter, down from 95 percent three months ago. 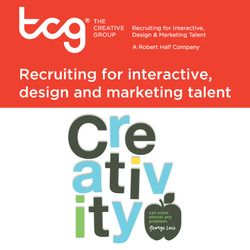 The Creative Group Hiring Index for Marketing and Advertising Professionals is based on more than 250 telephone interviews — approximately 200 with marketing executives randomly selected from companies with 100 or more employees and 50 with advertising executives randomly selected from agencies with 20 or more employees within Canada. The interviews were conducted by an independent research firm. Information from the study is featured in the Robert Half Professional Employment Report (http://www.roberthalf.ca/per), launched last year and the first study of its kind to monitor the hiring environment for professional-level positions exclusively. Based on more than 1,000 telephone interviews with executives throughout Canada, it provides insight on employment trends to help businesses and job seekers prepare for the upcoming quarter. To see how hiring within the creative profession has changed since last quarter and how it compares to other sectors, please visit roberthalf.ca/per. TCG’s award-winning career magazine (http://ezine.creativegroup.com/), can be found at creativegroup.com.